Roots Red Sea is a small friendly resort ideally suited to divers and snorkellers wanting peace and quiet, but with the convenience of the small traditional town of El Quseir on its doorstep. The resort is surrounded by magnificent colourful mountains on one side and unspoilt Red Sea beaches on the other, making it a wonderfully relaxing destination. Pharaoh Dive Club has a base both at the resort and on the beach allowing divers to come and go as they please with easy access to a beautiful house reef. The centre runs daily shore trips to over 50 different dive sites as well as having their own zodiac and hard boat for full day excursions. 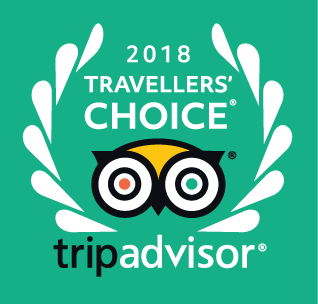 Roots Red Sea has won the TripAdvisor TRAVELLERS CHOICE 2018 AWARD – given to the top 1% in the category worldwide. This highly successful resort has won awards for the last six years, on two occasions they have won the Travellers Choice Award. Regaldive offer a package including flights, transfers, accommodation on soft all-inclusive basis in a modern chalet and 6 days diving. This package, is great value. Roots Red Sea has 29 rooms, consisting of Eco Huts, Deluxe Chalets and Superior Boutique Rooms. Regaldive offers Deluxe Chalets as the standard room type, which can be either twin or triple rooms. Superior Boutique Rooms may be booked at an additional supplement. All rooms are built using natural materials, a mixture of wood and local red stone. The wooden furniture and tiled floors enhance the authentic natural feel. The gardens have been cleverly created to minimize water usage but at the same time with some careful lighting help create a wonderfully relaxing ambience. Deluxe Chalets have timber pitched roofs and are constructed of local stone and timber clad walls. They offer modern decor, en-suite facilities, air-conditioning, flat screen LED TV, room safe and mini fridge. Superior Boutique Rooms are constructed from local stone and have decorative artisan built brick roofs. There is a large fully tiled shower room and toilet in each room. They offer modern decor, air-conditioning, wall mounted flat screen LED TV, room safe and mini fridge. Beach towels are provided for all guests. Roots Red Sea has a beautiful private beach area with free sun-loungers and sunshades, toilets and showers. Breakfast and dinner are served in the main restaurant with lunch taken at the beach restaurant. There is a bar and terrace area at the restaurant. There is also a beach restaurant serving lunch time snacks as well as a Bedouin tent serving coffee and sheesha. Wi-Fi is available at the camp for a local charge of 90LE per guest per week. A laundry service is available. Other activities on offer include football, volleyball and kite flying. Roots Red Sea is 140km (approx. 1 hour 45 mins drive) from Hurghada Airport and 84km (about 1 hour drive) from Marsa Alam Airport. The small town of El Quseir is easily accessible, allowing Roots to combine the advantages of remoteness without any inconvenience. Pharaoh Dive Club is based on site. El Quseir was once one of Egypt’s most important trading hubs, but today it is a tranquil destination that is almost entirely undiscovered. Shore diving is the norm here, and a number of pristine dive sites are accessible by jeep, truck, zodiac or sometimes day boat. Some excellent fringing house reefs also make El Quseir a great choice for those, including snorkellers, who want to enjoy the plentiful marine life without the crowds. El Quseir offers varied topography, abundant marine life and the advantage of less crowded sites. There are a few shallow reef patches, but generally the sites in this area cover multi depths that are not ideal for novices. However, if you want to study for your Advanced course, or develop your photography skills, then El Quseir is a great choice. There are up to 50 dive sites within easy reach of the centre, including Serib Kebir, the Rock and Sharm Fungani. You’ll enjoy exploring coral covered pinnacles on the sandy slopes, as well as navigating and exploring the labyrinth of coral gardens. Glide through narrow passages and blind alleys into the territory of the crocodile fish, moray eels, sea snakes, lionfish, porcupine fish and blue spotted stingrays. You may even find the elusive white tip or guitar sharks taking cover. Although not renowned for the larger pelagics, the area boasts a large and diverse fish population. El Quseir also offers a number of excellent house reefs, giving easy access to some wonderful dives with napoleon wrasse, turtles and even the occasional reef shark and leopard ray. Underwater photographers will delight in the macro life, with spectacular Spanish dancers and other nudibranchs on offer. For those wanting to experience dive sites further into the Southern Red Sea, boat day trips can be arranged to celebrated sites such as Elphinstone Reef, famed for its sharks, and the sombre wreck of the Salem Express. Pharaoh Dive Club are able to offer guided Tec dives as well as a rnage of Tec courses. For details, pease enquire with the Regaldive team. Pharaoh Dive Club is a PADI 5 Star Gold Palm IDC centre, located on the beach at Roots Red Sea in El Quseir. The British owned and managed centre has direct access to a good house reef. Zodiac and hard boat diving is available from El Quseir harbour, just 10 minutes away. The house reef has a very shallow area for training, and a dedicated classroom. The centre is fully equipped with new, modern rental diving equipment. There is also a Bauer Compressor with pure air certification, first aid and Oxygen all on-site. Down on the beach a permanent dive base has been set up with shaded areas for kitting up with hanging rails for wetsuits. A seating area for briefings and a house reef dive map are also here. Changing rooms, toilets and fresh water showers are nearby. Pharaoh Dive Club is also a BSAC training centre and are able to offer guided Tec dives as well as a rnage of Tec courses. Please enquire for details. Book your dive pack or course with Regaldive prior to departure, and benefit from lower prices than those in resort. Although individual dive packs can be booked, Regaldive offer a great-value package including flights, transfers, accommodation on soft all-inclusive basis and 6 days diving. Please discuss your requirements with the Regaldive team, who will prepare a quotation suited to your needs. This is a remote resort, situated about one hour's drive from Marsa Alam airport, or one hour 45 minutes from Hurghada airport. The hottest time of the year is July and August with air temperature of over 30 ºC. The coolest time is January with the temperature at around 20ºC. Rainfall is negligable and it is invariably sunny but breezes can be cool. Transfer: Approx one hour from Marsa Alam airport and one hour 45 minutes from Hurghada airport. A single entry tourist visa for Egypt is required for all nationalities. For British passport holders with British citizenship, Egyptian visas can be obtained conveniently and inexpensively on arrival at Marsa Alam and Hurghada airports. Everything We Expected and More, I Absolutely Loved it! "Our holiday was really lovely, we had such a good time! It was everything we expected and more, I absolutely loved it. We had no trouble at all and felt perfectly safe, from the moment we landed. They met us as soon as we come out of the airport and got us to our destination as soon as possible. The accommodation was superb and they continue to grow, it was kept very clean! I felt comfortable and had everything I needed, it was a home away from home and I can't wait to visit this place again. The food was amazing every single night and day. We even had a Sunday roast lol which was really nice, but they done stuff like burgers and home made chips, lasagna, spaghetti bolognese, pizza, fish and desserts. We was well catered for and I could not find one single fault with anything! The dive site I could talk about all day long, everyday we saw something new, it was beautiful. Crocodile fish, leopard Ray (which was huge), tornado Ray, nudibranch, loads of puffer/porcupine fish, of course the blue spotted Ray, we even saw a giant puffer fish!! We saw a Spanish dancer, barracuda, yellow fin tuna, scorpion fish and a huge stone fish. I could bang on all day about the life on this reef and there is loads more that I have not mentioned. We did not need to venture out at all. We did go to another reef though, 15 mins away to a nearby beach. This was just as nice, loads of canyons to explore! All of the staff were fantastic, very polite and always on hand if you needed anything! Lovely to be around and they worked really hard. I'm not sure if I can pick out a favourite memory from the holiday. In saying that though, on a Tuesday evening they have a BBQ in the beach with a fire and a small bar. This was great, we had done our night dive and when we come out, we sat down for some dinner under the stars on the beach - what more could you want? This is the second or third time that I have booked with Regal Dive - the service is 2nd to none and I am always very happy with it. I will definitely be booking again in the future!" I'll be back... and so should you! "I don't do a lot of reports these days because the reviews are either self written or bleating and moaning rubbish, but after 10 days at Roots Luxury Camp I felt I needed to put a few words down for the uncertain reader who is unsure if they should go. Well the answer is GO! We try not to do the same place diving more than once and the only place that has really inspired us in Egypt after trying most places was Dahab until we came across Roots. It's just brilliant, the site is brilliant, the management are brilliant, the staff are brilliant, the coral is superb and the sea life is as good as it gets in Egypt and the best I have seen. The dives offer easy for the beginner to challenging for the experienced and the house reef is just unbelievable and you could easily holiday just doing this reef. To top this, they have a range of really exciting off site shore dives, boat dives, wreck dives and so I could go on and on. This is a true divers resort from beginner to expert, without all of the pretentious puffed up rubbish you get in Sharm. The food is fantastic, everyone speaks to everyone, it has a maximum of 50ish on site and I will say it again, the food is excellent. I’m going again and if you try it, you will be planning your next trip back as soon as you get home too! "Just to let you know we had a lovely time at Roots again. Steve and Claire have updated a lot of the facilities since last year, there is now a solid walkway down the beach to the house reef for example, without losing any of the family atmosphere which makes it such a pleasure to dive and stay there. They are updating the dive hut on the beach and it already has a solid floor and more bench space and that will soon have loos and shower rooms. Moody and Martina looked after us for half the week as Steve and Claire were on dive safari. They did the usual great job. The amazing chef is still there and the food is as good as ever! In fact I do not think they have lost any of the staff who were there last September when we went which is I am sure one of the reasons it works so well. The transfers went well too minimising the stress levels. I would also like to mention Mohamed Gamal, your local rep. He met us at the airport, made sure we got our ride and phoned during the week to make sure we were OK. Nicely done.